During the summer of 1998 Portsmouth hosted the second International Festival Of The Sea. It included Royal Naval Ships, Sailing Ships, in fact a variety of all sorts of ships from big to small craft. The event attracted tens of thousands of people. Portsmouth Harbour during the event was covered with ships. The event included ships from a large number of different countries and included all Portsmouth's Historic Ships, entry into the Naval Base, Bands, Stalls and much more. 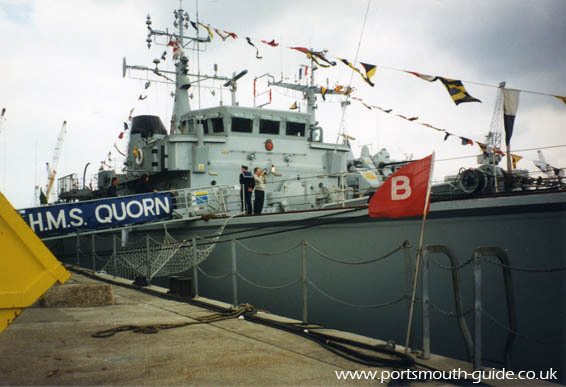 The ships arrived at the festival during the week beginning Monday 24th August 1998 and the above picture is of a Royal Naval Ship, which is an example of the sort of ships that could be seen at the festival. The Naval ships that were at the International Festival Of The Sea were Invincible, Fearless, Endurance, Birmingham, Nottingham, Liverpool, Manchester, Iron Duke, Marlborough, Berkeley, Ledbury, Bridport, Sandown, Alderney, Sir Bedivera, BNS Wandellaar (Belguim Warship), TNS Gazantiep (Turkish Warship) and FS Sagittaire (French Warship). The tall ships at the event included the Festival are Matthew, Libertad, Sedov, Kruzenshtern, Grand Turk, SS Shieldhall, Pogoria, Kaskelot, Iskra, Mir, Kaliakra, Astrid and Sir Winston Churchill. 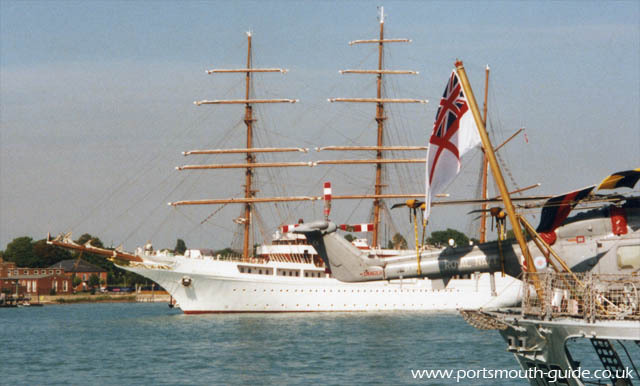 The above picture is of the Sedov which attended the festival from Friday 28th August 1998 to Sunday 31st August 1998. The Sedov is a 4 Masted Barque Full-rigged Ship which was built in 1921. Ships arrived and departed during the festival week. The Festival was broadcast on a number of different television channels throughout the world and attracted hundreds of thousands of viewers. There is another page about the International Festival Of The Sea Portsmouth which is worth looking at.